We all remember October last year, it will be in the memories of Liverpool fans forever. With the club on verge of financial meltdown and the club being near the relegation zone the whole season, there was no hope for the Liverpool fans. 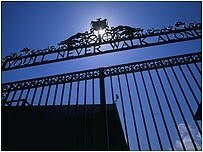 But, as our famous anthem "You´ll Never Walk Alone" says, "at the end of a storm there´s a golden sky." John W. Henry´s FSG bought the club, repaid its debt and promised investements in the squad. In January the under-fire manager Roy Hodgson was sacked and replaced by club legend Kenny Dalglish. Kenny lead Liverpool to a great finish of the season, with victories against Manchester City, United and Chelsea among the good results. The captures of Luis Suarez and Andy Carroll showed that the owners will fulfill their promise of investing in the team. This summer was a summer of big expectations for Liverpool fans. They were not left dissapointed. Captures of talents like Jordan Henderson and Sebastian Coates, buying proven Premier League players and getting rid of the deadwood mean that Liverpool, now have a team ready to compete for the title. With Arsenal being unable to replace Fabregas and Nasri, it seems like Liverpool won´t even need to fight for a top 4 place. In fact it has been served to us on a silver plate, we just have to take it. If Liverpool manage to get back to the Champions League, they will be able to lure higher profile players. With the owners willingless to invest, Dalglish's great managerial skills and Comolli's eye for talent, Liverpool fans have all the rights to be excited. The Premiership may soon sail into Liverpool's hands. With Andre Santos and Mertesacker to be announced today, it leaves Wenger needing another centerback, and some fresh blood in the final third of the pitch to open up defences. With Arsenal fans questioning the manager for the first time in his 15 year regime, the next 48 hours will define Arsenal's season; by 31/08/11:01 Arsenal could have bought 5 new players which would change the gunners prospects for the season, or Arsenal will sign Santos and Mertesacker, but not buy the extra defender they need or the world class creative midfielder that is so desprately needed to fill the boots of Na$ri and Fabregas. Arsenal fans should keep calm and see what Wenger does in the next two days that's the least he deserves for his wonderful contribution to Arsenal FC, 14 years in the champions league with an average net spend of £1.6million per annum, to go with being a 3 time league winner with Arsenal, and a 4 time FA Cup winner, which makes him the most successful manager in the clubs history. Only United and Madrid have longer streaks of Champions League qualifying, there is a reason why in the summer of 2006/7 Madrid offered Wenger £11million pound per annum to manage them yet he remained at Arsenal, even though he could of earned £7million more at the Bernabeu. Yet some Arsenal 'fans', don't repay the loyalty he showed to the club. With the international break taking a bit of heat off Wenger, he'll be pleased to see that his next opponents are Swansea, and the word backlash springs to mind if you thought the 8-2 drubbing of Arsenal was horrific, which it was; then the Swans will be squashed . Maybe Wenger and his team will regain the confidence in their next 3 games, if not a long season awaits for Arsenal, and a increasingly fragile looking Arsene Wenger. With Wenger in France you would imagine that Marvin Martin is the man he wants to replace Fabregas, and ignite the frontline. And with Mertesacker adding height to the Arsenal defence, Wenger has started his 36 hour spending spree well. Thanks for reading this post. Cheers. Ligue 1 giants Lille and Marseille played out an enthralling game which saw the Dogues pick up all three points, despite OM taking the lead at Stadium Lille Metropole on Sunday night. Both sides found out their Champions League opponents in midweek, with Rudi Garcia’s men facing a tough trip to Inter and to Russia to face CSKA Moscow. L’OM will be taking their vociferous support to London (Arsenal), Dortmund and Athens (Olympiakos) over the winter months. Lille were hoping not to implode as they spectacularly did in July’s Champions Trophy clash in Morocco. The hosts were up 3-1 with 85 minutes played, when five goals in the last five minutes saw Marseille steal the trophy 5-4 within normal time. That result must’ve still irked the home faithful, and it showed when Moussa Sow slid in on a cross and direct the ball past Steve Mandanda for 1-0. L’OM normally are slow starters to the league season, and after three consecutive draws, they were desperate for a first league win. Deschamps’ team-talk must’ve done wonders at the interval. Straight after the break, Loic Remy, who has been enjoying a fine run of form, saw his effort bounce back off the post. It didn’t matter though, as Mathieu Valbuena got the break they needed when his long range effort was deflected over Mickael Landreau in the home goal to equalise. Le Petit Velo, courted by Arsenal, pounced on a rebounded shot from Cheyrou to double the visitors lead after the hour to turn the match on its head. The Dogues response was great, as they peppered the visitors’ goal with unsuccessful efforts before Auerlien Chedjou’s equalising goal came five minutes later. The game winning moment arrived with fifteen minutes to go as Rod Fanni felled Eden Hazard in the box. Moussa Sow stepped up to grab his second of the evening – the Senegalese was last year’s top scorer in France. Marseille are now winless in four games this season, and face Europa League hopefuls Rennes after the international break. After what we all Gunners suffered this past Sunday, I decided that it was the moment to write my first article for this great blog. I want to share with you all my thoughts about what we should do as fans of such a great club. First of all yes, I do consider Arsenal a great club, not just because is my favourite team, but also because it is simply great. We just need to look back and remember all the things it has achieved. Also it doesn't matter if have had bad moments, Arsenal has always found the way to get over those times and that is what makes us a great club. So that makes me want to tell you this, I think that there are two things that are important and we must not forget, to be together and supportive with the players, and have patience. Let's talk about the second one, which most of you might say or think: "how can we have any patience if haven't won anything in the last 6 years? ", "how to be patient if we don't bring enormous signings?" and so many more reasons. I believe that, even though you are right in saying such things, we must try to understand the fact that the team is young ( as it has been for the last seasons, I know) and although we have had great players as Fabregas and Nasri the "greedy", they didn't have patience, they didn't believe on the team that is growing, and contrary to them we have to be patient, because we have a bunch of players that are not just good and have incredible qualities such as Ramsey, Jack W., Chamberlain, etc, but they believe in Arsene W. and have put their hearts in Arsenal. And with that last thing said is that I connect the two reasons, patience and togetherness. We must show them that we won't turn our backs to them, we will show them our love to the club and that we believe in them. We all want to forget about the last game, we all do and we will because this team has given us so many great memories and they will keep on coming, we have 125 years of history and a bad, really bad game shouldn't make us believe that a catastrophe is coming. We must, indeed, believe that with patience things will come, they always come and let's not force for a change, instead let's sing: "We love you Arsenal, we do..."
So it begins, or is it the end? Hard to tell sometimes, but anyhow the Transfer Window is reaching its climax. Expect a lot of wheeling and dealing for those teams in dire straits, like our very own Arsenal, but don’t forget those teams who are missing maybe one or two pieces. We’ve reach the end of day one, and already teams are pulling some interesting signings and some possible juggernaut rumors that could alter the entire stage of the English Premier League. Arsenal FC have agreed with newly relegated Turkish side Fenerbahce to buy left back Andre Santos for sum of what is believed to be £6.2 million. Overall it’s the kind of signing Arsenal fans expect from coach Arsene Wenger, a solid, cheap option over the popular favorite replacement for Gael Clichy in Everton’s Leighton Baines. Arsenal have also reportedly looked into raiding their London rivals Chelsea of a few players, Brazilian center back Alex, and midfielder Yossi Benayoun. Also according to the Daily Mirror, Arsenal are back to looking at Sochaux midfielder Marvin Martin, who is valued at £12 million. Meanwhile Rennes continues to be stubborn about defensive midfielder Yann M’Vila. Arsenal made a bid of £22 million for the midfielder, but it is rumored the French team would want closer to £30 million, a price tag Arsene Wenger might shirk away at. Finally, conflicting reports have been coming out on Dutch winger Eljero Elia. Elia, owned by the German club Hamburger Sport-Verein, or Hamburg as it’s commonly named, is rumored to be worth about £9 million, with dozens of teams interested including Arsenal and Italian side Juventus. Now, some reports say Juventus has already agreed to a deal with Hamburg, while others say Arsenal are close to a deal. Question is which is true? Tune in tomorrow to find out, right? Honestly I haven’t the clue what’s true or false. I do know he would prefer to go to the EPL, as he said in an interview with Dutch TV just today. But in reality, it’s not really his call. In France, Lille midfielder Eden Hazard has put a rest to the rumors that he is leaving the Ligue 1 side. "The rumours must stop. I'm staying at Lille." Simple enough, yet tragic enough to break the hearts of thousands of Gunner fans who had hoped otherwise. The big story of the day though, was when a report came out that the young German squad Borussia Dortmund declined an offer from Arsenal for young German wonderkid Mario Goetze. "Mario will stay at Dortmund, for sure, the next two years.” Said Volker Struth, Mario’s agent. “There is no chance of him going to another club this window.” Struth would go on to add, "This is because he is so young and it is too early in his career for him. The club, the player and his family, we are all of one mind that it is better for him to stay there because he is happy at Dortmund." In a way, it makes sense, why would Dortmund sell Goetze now, when next year they know they can command a lot more money for him. He will have Champions League experience, he will have another year in the Bundesliga under his belt, and gives Dortmund a very good chance at competing for the league title this season with his partner from Japan, Shinji Kagawa. Also, heard today that Diego Forlan has finalized his move from Atletico Madrid to Internazionale Milan today. This is a good signing for Milan to replace Samuel Eto’o, who has run off to Russian side Anzhi Makhachkala for £28 million. Yes, I also had to look on a map to find Makhachkala, you’re not alone. Nonetheless, Forlan gives Wesley Sneijder that little assistant that he had with Eto’o, so Inter fans rejoice, you may salvage a trophy with this deal! So at the end of day one, what have we learned? Arsenal seem poised to attempt a “wow!” signing to appease the fans, but is it too little too late? Will they make another offer to Dortmund in an attempt to call their claims a bluff? Will they cave in to Rennes demands and give £30 million for Yann? What’s really going on with Eljero Elia? We’ll all just have to wait and see, so stay tuned folks as I’m sure this is just the beginning! After building much needed momentum on Wednesday night with in Italy, Arsenal headed to Old Trafford on Sunday hoping to turn around their domestic season. Missing key squad members through suspension and injury, the Gunners youth would be on display. Could Arsenal pull out a shock result at the Theatre of Dreams? It was a shock result, but not the one the Gunners had hoped for. Arsenal suffered an embarrassing loss at Old Trafford, conceding eight goals to champions Manchester United. It was the worst loss by Arsenal under Arsene Wenger. The last time the Gunners surrendered that many goals it was 1896 and Queen Victoria sat on the throne of England. Manchester United’s first goal came from comical Arsenal defending in front of the goal. Comical in an “I’m laughing because this is painful” kind of way. Unfathomably, a United chip into the box was allowed to bounce as two Arsenal defenders watched, leaving Szczesny in no man’s land. United’s Danny Welbeck had an easy header for the game’s opening goal. The extremely frustrating part is that play came right through the middle of the Arsenal defense. Would the goal have scored if Vermaelen were fit? Possibly not, but the defensive problems still remain. From there Theo Walcott drew a penalty, and things started to look up for Arsenal. Captain Robin Van Persie had his attempt saved by United’s young keeper, and all the momentum was back with United. Goal number two, though a brilliant shot from Ashley Young, came about as the defense did not close him down properly. You simply cannot give players of United’s quality an inch and not expect them to take advantage of it. The same can be said of the third goal. After a poorly taken foul just outside the box by Arsenal, Wayne Rooney stepped up for the free kick and made it 3-0. Arsenal cannot afford to give away cheap fouls in such a dangerous section of the field against any opponent, but especially not against the champions. The last real event of the first half was the Walcott goal, a gift from De Gea, as it passed through him as if he were a hologram. It was Arsenal’s first league goal of the season. The second half offered little for Gooners to be pleased with. I’m not going to outline the other five Manchester United goals here, because they are all basically products of poor defending and lack of quality. The eighth and final goal came as a result of the Arsenal players giving up and not tracking back to help the defenders who clearly were not of enough class on the day. There were few positives to take from this display. At least that fixture is over for the season. Defensively, Arsenal were in shambles against United. Sure, Arsene Wenger can sign Gary Cahill, and that would help. The problem is if Arsenal continues to play their line as high as they do, they will continue to get beaten with through balls and over the top of the line. The defensive tactics need improvement as well as the quality of the players. Both need to happen. Too often in the past few seasons the Gunners have been beaten over the top for a goal, and are left standing there holding their hand in the air hoping for an offside call. Carl Jenkinson was horribly out of position on several occasions during the match. At one point, United’s Patrice Evra actually seemed to be looking around wondering where the defender was that should be where he had the ball. He was so out of position in fact, that he received a tongue lashing from Theo Walcott on at least one occasion. You know you are out of position when Walcott is questioning your defensive positioning. Manchester United had their way in the middle of the park. Arsenal midfielders allowed too much space and gave the United players too much time on the ball. Arsenal need to get back to pressuring the ball in the midfield. Offensively, there were not many pass link-ups. Something was definitely lacking. Shall we call it creativity? To be fair Arsenal were without Gervinho, Alex Song, and Emmanuel Frimpong through suspension. Also missing the game through injury were Thomas Vermaelen, Abou Diaby, Bacary Sagna, Sebastien Squillaci, Jack Wilshere and Nicklas Bendtner. Arsenal put out a team that was far from their best, it is true. The problem was the team they put on the pitch did not have near the quality we expect from Arsenal. In recent years, Arsenal would play their young players in the Carling Cup and still be able to advance to the late stages. The squad against Manchester United was horribly outclassed. The quality simply wasn’t there. Armand Traore isn’t good enough to play for Arsenal, if we are to believe that Arsenal is still a big club. Johan Djourou has had many chances to prove his quality, and at times last season he seemed he would. Yet, he was woefully short against Manchester United yesterday. I would have preferred the young Spaniard Ignasi Miquel to Djourou. Arsenal were able to score their first goals of the domestic season against United. Walcott and captain Robin Van Persie tallied for the Gunners. In five games overall (foreign and domestic) Arsenal have now scored five total goals. Three have been scored by Walcott, and the other two by Van Persie. AS Monaco’s Park Chu-Young seems certain to join the squad in the next 48 hours, so there is help coming to the frontline. To those who question the signing of Park because he will only cost £3-5 million pounds and you haven’t seem he play because you don’t watch the Ligue A, please shut up. Park has a talent for free kicks, which Arsenal desperately needs and he actually wants to play for Arsenal. So bad, in fact, that he basically left Lille standing at the altar on his signing. Park is the captain of the South Korean National team. He has quality. The fact that he isn’t a “big name” or “big money” signing doesn’t matter. How many of you had heard of Eduardo before he was signed? Emmanuel Adebayor? How about Robin Van Persie (who Arsenal paid less than £3 million pounds for)? We need to manage expectations to a point. Yes, Arsenal need to add quality. But we cannot scream for Wenger to sign players, and then complain when he does. The complaint about the signing of Alex Oxlade-Chamberlain signing was that he was young and inexperienced. Well, the boss is about to sign a 26 year-old National Team captain, and you complain about that. It can’t go both ways. This type of reaction is a product of not winning trophies for six years. At this point, no matter what Wenger does it will be questioned until he wins another trophy. I know I seem the eternal optimist, but Arsenal can still win their next 35 league games. The season is not lost. Things do, however, need to change. Defensive tactics have to change. Vermaelen has to have a central defending partner he can trust. At times it seems Koscielny fits the bill, but Cahill or Everton’s Phil Jagielka would be preferred. The team is in desperate need of a left-back as well. Englishmen Kieran Gibbs, though he has shown some quality this campaign, is injured too often. He practically needs his own trainer at this point. He cannot be relied on as a first-choice selection. Carl Jenkinson is a nice squad player, but is not yet good enough to be first-choice for Arsenal. The other problem with Jenkinson is that Wenger always plays him on the right, meaning Sagna is moved to the left, out of his normal position. Arsenal are simply too thin at the back. Defennsive cover must be brought in before August 31st. I’m confident that Miquel can contribute long-term, but he is not the answer right now. In midfield and playmaker is desperately needed. I think all Arsenal fans would love to see Eden Hazard arrive from Lille, which basically means it won’t be happening. It will be difficult to convince Hazard to come to the Emirates following the 8-2 loss on Sunday. Rumors had him already agreeing to personal terms with Arsenal, but so far they have been unsubstantiated. I believe Wilshere, when he returns from injury, will assist in playmaking duties. He is more naturally talented as an offensive midfielder. Whoever the holding midfielder is, Alex Song or Emmanuel Frimpong, they need to remember that they are the holding midfielder. Too often last season Song ventured forward, leaving the already weak defense exposed. He needs to watch some film of Gilberto Silva, and practice what he learns. The occasional goal is nice, but protection for the back is what’s needed from the Cameroonian midfielder. With the addition of Park Chu-Young, the front line will consist of Van Persie, Gervinho, Walcott and Chamakh. This of course assumes that Bendtner does, in fact, leave. This is a group that should able to produce goals, provided there is some assistance from midfield. Arsenal needs to add quality before the transfer deadline for this season not to be a loss. Right now, fourth place seems like a goal too lofty for the Gunners to achieve. For Arsenal, that is unacceptable. This club expects to compete for trophies, not to hope for a chance to be in the Champion’s League play-off round. These are truly worrying times for Arsenal, as they have started the league season earning just one point from nine, and leave the month of August eight points behind the leaders and sitting in a dreadful 17th place in the Premier League table. The Gunners also have the worst goal differential in the league. Can Arsenal rebound from the demolition at Old Trafford? Yes, they absolutely can, but not with the current squad. Changes need to be made, and time is running out.